Jeff Poeschl, in his 20th season coaching the Zephyrs, said this is his deepest team. Mankato East/Loyola (16-10-2) vs. Mahtomedi (No. 2, 21-6-1), 11 a.m. Scouting the Cougars: Goalie Jack Cusey, a 6-1, 190 pound senior, is routinely serenaded by chants of “Cuuuuuus” when he stops the puck.Cusey has allowed two goals in three section playoffs games and has a 1.87 goals-against average and .931 save percentage. Five freshman play regularly, led by Layten Liffrig (6-2, 170), who has 12 goals and eight assists. Fifth-year coach Adam Fries calls him the team’s fastest player. Adding to the offense is Matthew Salzle (14 goals, seven assists), a sophomore generously listed at 5-8, 155. Scouting the Zephyrs: Jeff Poeschl, in his 20th season coaching the Zephyrs, said this is his deepest team. He regularly rolls four lines and six defensemen. 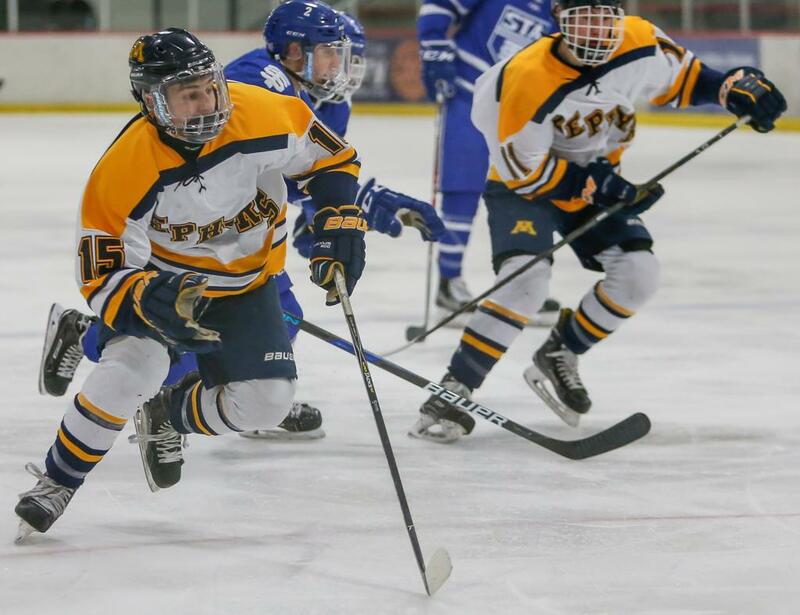 The Zephyrs have nine players with eight or more goals, led by senior Charlie Bartholomew with 15 and sophomore sharpshooting linemate Nikolai Dulak with 14. The state’s sixth-most penalized team in the regular season, Mahtomedi killed penalties at a sterling 88.5-percent clip. Senior forward Sam Jensen and junior defensemen Connor Stoker and Wyatt Begley are among the team’s top penalty-killers.